One of our project partners has just released a publication that deals with the replication crises in economics and the social sciences. We live in a time of increasing publication rates and specialization of scientific disciplines. More and more, the research community is facing the challenge of assuring the quality of research and maintaining trust in the scientific enterprise. Replication studies are necessary to detect erroneous research. Thus, the replicability of research is considered a hallmark of good scientific practice and it has lately become a key concern for research communities and science policy makers alike. 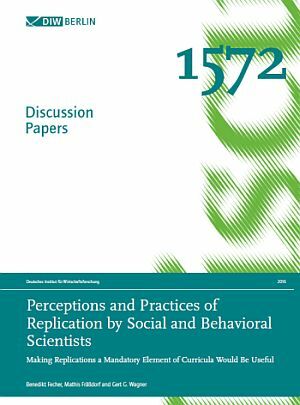 In their discussion paper Fecher, Fräßdorf and Wagner analyze perceptions and practices regarding replication studies in the social and behavioral sciences. Their analyses are based on a survey of almost 300 researchers. The study provides interesting findings: For instance, two thirds of all respondents disagreed with the statement that “replications are not worthwhile, because major mistakes will be found at some point anyway“. Nevertheless, most respondents are not willing to spend their time to conduct replication studies. According to the authors, this situation can be characterised as a “tragedy of the commons”: everybody knows that replications are useful, but almost everybody counts on others to conduct them. Another interesting finding is that among the few replications that are reported, a large majority is conducted in the context of teaching. Therefore Fecher, Fräßdorf and Wagner concluded that it would be useful to make replication studies a mandatory part of curricula as well as of doctoral theses. Also data sharing needs to receive more recognition, for example by considering data production and subsequent data sharing as scientific output.